Alan Dunlop states, “East Park want to establish a centre of excellence in Glasgow for the residential care and teaching of young people with very special needs, including autism. I’m working with a talented design team, on a challenging project and for a committed, enthusiastic and engaging client ……what more could an architect wish for”. Alan Dunlop has been commissioned to build new projects for East Park, within their existing campus in Glasgow. East Park has provided education and supported accommodation services to children and young people with additional support needs, including autism, since 1874. The new project will include additional residential, studio respite accommodation and classrooms and be submitted for planning approval in February. Construction is programmed to start on site in June 2014. The design is refined with the plan and section uncluttered and the detailing pared: to create an empathetic and supportive environment for children and young people with special needs, their teachers and carers. Service and vehicle access to the existing campus has been reworked to make a clear separation between the existing car parking and service routes around the school and the residential environment: to improve safety and ease of movement throughout. The new residential and studio respite accommodation at the east end of the East Park campus will help enclose a new “Town Square” and establish a distinctive identity and secure pedestrian courtyard entrance from Maryhill Road. Circulation and access continues from the existing school plan. Both the new class rooms and studio accommodation are single storey, which makes access easier for residents and staff. 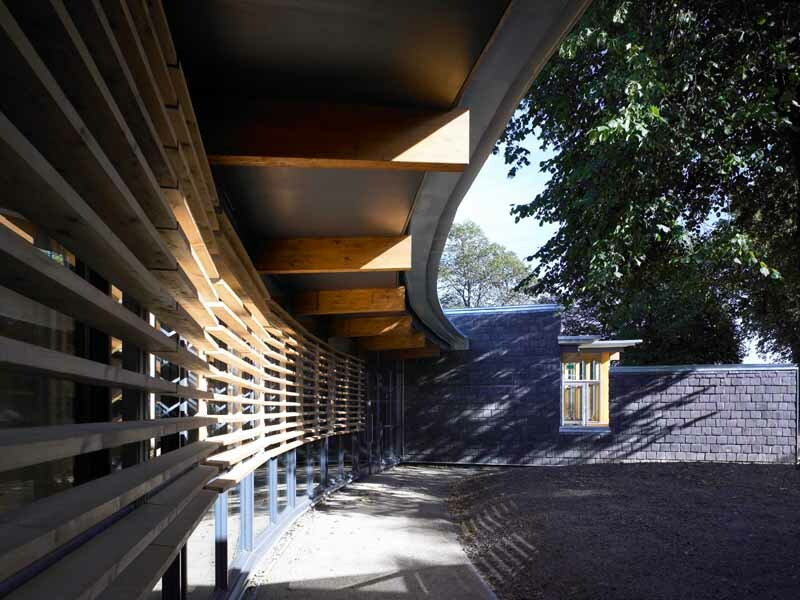 Alan Dunlop also designed Hazelwood School for children and young people who are blind and deaf, with cognitive impairment and mobility challenges. Hazelwood has won recognition worldwide as an exemplar project and many national and international awards for architecture and designing for children and young people with acute special needs, their teachers and carers.